My history with bookshelves is expansive. I have always loved books and always been a reader. I’ve always had bookshelves in my room, and I’ve always owned books. I feel so lucky to say this, especially since my parents also took me to the library every few weeks. There was never a shortage of books, I was always encouraged to read, and I was always given time to read. Now I have a house I’m in love with, and want to stay here forever (knock on wood), and my bookshelf situation is still shifting. I have a bookcase in my office, with library science, literacy, and reference books. Oh, and the bottom shelf is picture books. Of course. My son’s room has 2 bookcases bursting with picture books. The back room has 3 bookcases, two of adult novels and one of children’s reference and kids’ picture and activity books. 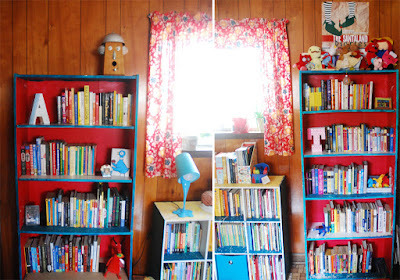 I would love to have gorgeous built-in shelves in my back room, which is a playroom/hobby room for me and my son. But who wouldn’t love built-ins?! I am still trying to get rid of books I don’t love. I want to look at my shelves and see titles that inspired me, opened me up to different worlds, showed me how others live. My bookshelves are scattered throughout the house. In weird spaces where nothing else would fit... Ah, books are wonderful. I love the idea of having them scattered! Yet also dream of the Beauty and the Beast massive library with the ladder, haha. That room and those shelves sound gorgeous! I definitely need more bookshelves! Mine are all squished on a tiny one in my room and my daughter's books are taking over the house. I love that she loves reading so much but I need to find a way to make it tidier! My son's picture books are taking over, but I love them just as much as he does! I'm saving a lot of my favorites from elementary school for him to read, too. But we'll have to use the library a lot, because if we get many more books, they'll take over the house! I have bookshelves all along the walls in my hallways. Makes the hallways kinda narrow, but lots of room for the books! I think I'm too claustrophobic to have shelves in the hallways, but I bet it looks cool to look down the hall and see nothing but books!